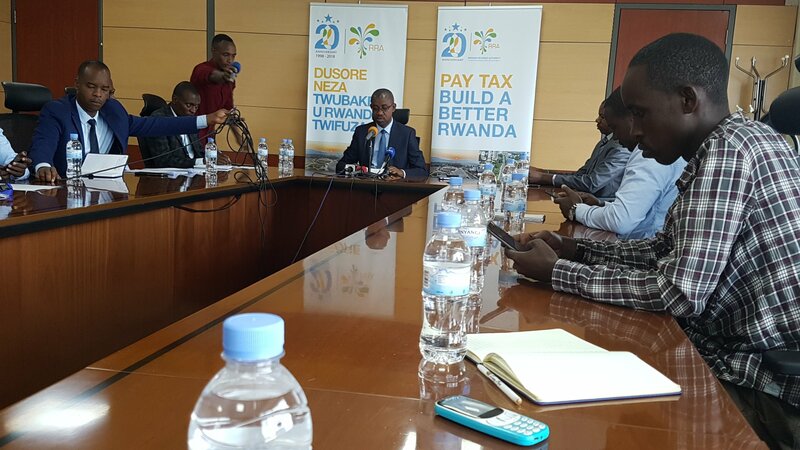 Rwanda Revenue Authority (RRA) says it collected Rwf666.0 billion worth revenues in the first six months (July-Dec 2018) of the financial year or Rwf111 billion monthly revenues collected – representing 100.8% mark (Rwf5.6 billion) above the Rwf660.4 billion target. Addressing the media on Tuesday to present performance results for semester one, RRA Commissioner General Pascal Bizimana Rugemintwari said that the taxes collected were from tax and non-tax categories. “Tax revenue collection for July-Dec 2018 was Rwf654.4 billion while the target was Rwf651.5 billion; this is an achievement of 100.4%, and an excess of Rwf2.9 billion above the target,” Rugemintwari told journalists. According to RRA, the latest results surpassed Rwf582.9 billion collected in the first semester of 2017/18 financial year – representing an additional Rwf71.5 billion that was collected or 12.3%. Of the revenues collected, RRA says, non-tax revenue collected amounted to Rwf11.6 billion compared to the target of Rwf8.9 billion, performing at 130.2%. Compared to a similar period last year, the non-tax revenue collected an additional Rwf3.0 billion – representing 34.3% growth. Furthermore, in the first semester of this financial year, taxes and fees collected from local government organs totaled to Rwf22.7 billion – representing 98.2% of the Rwf23.2 billion target.